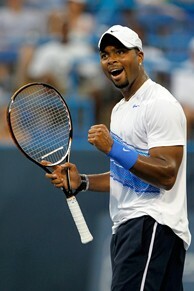 Donald Young won his opening match at the Legg Mason Tennis Classic. WASHINGTON (AP) - Donald Young's 22nd birthday was a little more than a week ago, and his tennis career has not taken off the way he - and plenty of others - figured it would when he turned pro as a teen in 2004. Young is keeping at it, and adjusting his expectations along the way. The American ended a three-match losing streak by reeling off 14 consecutive points in one stretch and easily beating qualifier Artem Sitak of New Zealand 6-0, 6-3 Monday in the first round of the Legg Mason Tennis Classic. Young is 128th now; his career-high ranking was 73rd in April 2008. In other first-round action at the hard-court tuneup for the U.S. Open, former top-five player James Blake of the United States beat Tatsuma Ito of Japan 6-3, 6-3 in under an hour, Radek Stepanek of the Czech Republic came back for a 6-7 (2), 6-4, 6-0 victory over Philipp Petzschner of Germany, Igor Kunitsyn of Russia eliminated Gilles Muller of Luxembourg 6-4, 3-6, 7-6 (5), Chris Guccione of Australia beat Alejandro Falla of Colombia 7-6 (3), 6-3, and qualifier Marinko Matosevic of Australia got past Richard Berankis of Lithuania 7-6 (3), 3-6, 6-1. The tallest player on tour, 6-foot-10 Ivo Karlovic of Croatia, lost to 5-foot-8 Michael Russell of the United States 6-4, 7-6 (4) in Monday's last match. Unlike Young, Blake tries not to keep too close an eye on his ranking. Never has, even as he's swung from No. 4 in 2006 to 135th at the end of 2010, and back up to 90th this week. The 31-year-old Blake has invited Young to come train with him in Florida. Having hit years ago with stars such as Pete Sampras and Mats Wilander, Blake knows that sort of thing could be a boost for Young. Those top two American men in the rankings are skipping the tournament: No. 8 Fish's withdrawal was announced Monday; No. 12 Roddick's was announced last week. Fish cited a bruised right heel. Roddick has a side muscle injury. Fish was replaced in Washington's draw by Wayne Odesnik, who lost in qualifying. Odesnik returned to action in January after serving a one-year suspension because Australian customs officers discovered human growth hormone in his bag when he arrived in that country for a tournament. In the second round at Washington, Odesnik will face the 54th-ranked Stepanek. Tuesday's schedule includes Blake against defending champion David Nalbandian; 19-year-old American Ryan Harrison - who is coming off consecutive semifinal appearances at ATP tournaments - and 11th-seeded John Isner. Young, who is coached by his parents, said his relationship with the U.S. Tennis Association is ``back to the way it was,'' after a dustup in April, when he posted an obscenity-laced message on Twitter criticizing the USTA. On Monday, Young didn't face any break points and broke Sitak four times. Young broke at love for a 5-3 lead in the second set, then served it out, hitting a 113 mph ace to earn match point, which he converted with an overhead winner. Not that he was ready to place too much stock in this victory. His opponent, after all, is ranked only 387th. Here is one indication of how unheralded Sitak is: The prematch graphic on the in-house TV feed, shown on screens in suites and elsewhere around the grounds, featured a photo of Young, but a drawing of a tennis racket where Sitak's picture should have been.